We’ve seen dogs wear clothes, and even cats. But birds? Not so much. 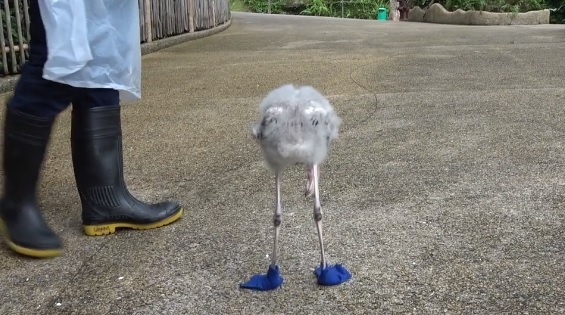 A video started circulating of a flamingo wearing blue booties, and we’re totally in love with the little guy. The flamingo is named Squish, and according to Mashable, he was abandoned by his parents before hatching. Luckily, he was spotted by some kind people at Singapore’s Jurong Bird Park and had a successful arrival in June. He’s been put on a strict diet and requires a bit of exercise to strengthen his leg muscles, which means he’s been going on a lot of walks with his handlers. To help him out a bit, they’ve custom made the booties — which is just such a lovely gesture. Squish loves flaunting those shiny blue shoes! This adorable ball of grey has been the subject of much love and pampering – human carers even custom made Squish a fancy pair of shoes for his daily exercise. The booties help his still-developing feet, especially against the hot concrete that’s around his new home. And he also looks super adorable when walking around in them, which is an added bonus. Since Squish is still young, he often needs to take rests in-between all the activity. We can relate. But he never gives up, and always finishes his walk. 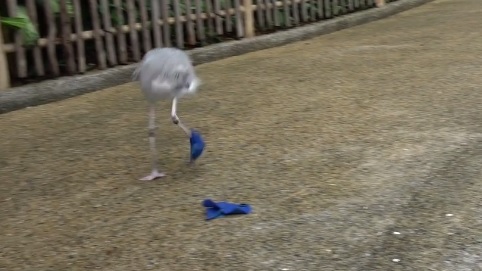 Since Wildlife Reserves Singapore knows exactly what we like to see, they also included some incredible bloopers in the video. It’s important to remember that since he’s still developing, he might have a few spills every now and then. Or, he might just not be into wearing his booties that day. Once again, we can relate. Flamingos gain their popular pink color based on what they eat, and it’ll take Squish about two or three years to develop it himself. We hope to continue watching his journey until then.